When I was a kid my mom and I would do puzzles all the time. Not little 50 piece one, but huge, sprawling 1,000 piece puzzles with mind-numbingly large sections of sky or something equally ridiculously difficult. Our strategy was always to start with the edge pieces and work our way, and so I’ve kind of found myself drifting towards this strategy in my park visits as well, drawn to the edges of Toronto–the places that I’ve explored the least. 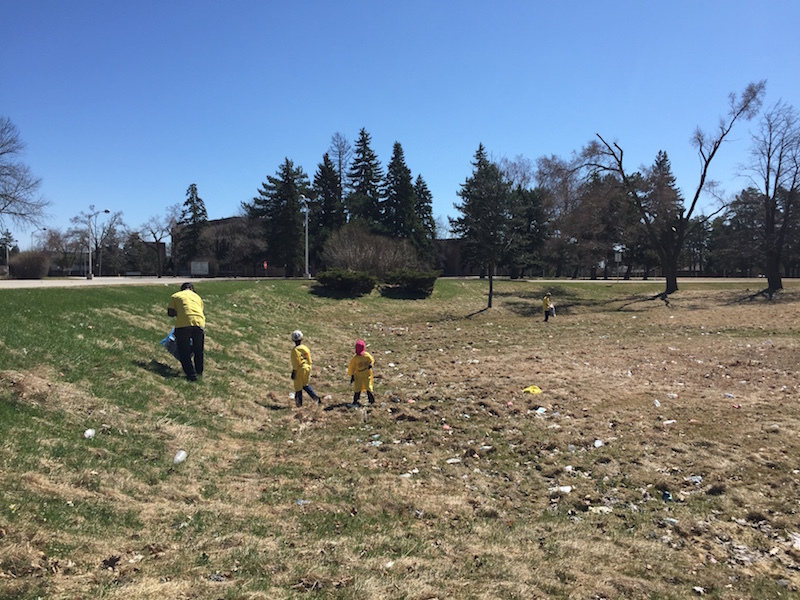 For Clean Toronto Together, the day when everyone in the city rolls their sleeves up and goes out to clean up their neighbourhood park, I headed to Panorama Park in the far north-west corner of the city. This is a park set within many high-rise towers–a not uncommon site in Toronto. It’s fairly large, but mostly wide expanses of grassy areas with a few small slopes that lead up to the parking lots of buildings. 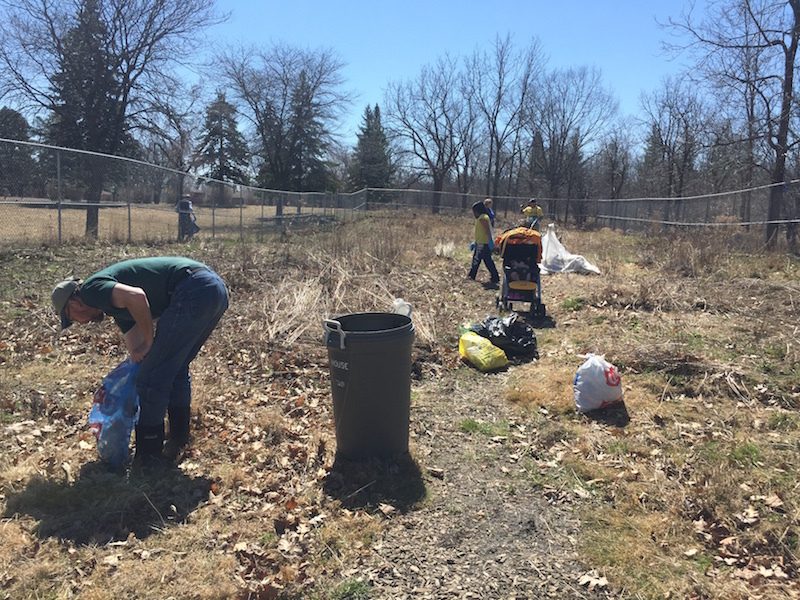 The park also has an active community garden group and so we were there to clean up the garden for the new growing season and also the park around it. The garden is newly enclosed within a tall chain-link fence, which looks a bit imposing, but was there, I was told, to keep the deer out. A woman told me that deer might just jump over the fence, which seemed impossible to me. It would have to be super-deer because this fence is pretty tall. Then again, my cat has surprised me by jumping onto the top of the fridge before, so who knows. Cleaning up garbage in a park sounds like maybe the most boring, awful activity, and yet it somehow becomes fun. It’s very satisfying to take a park that looked pretty grungy before and see a huge improvement. And you find some weird things. 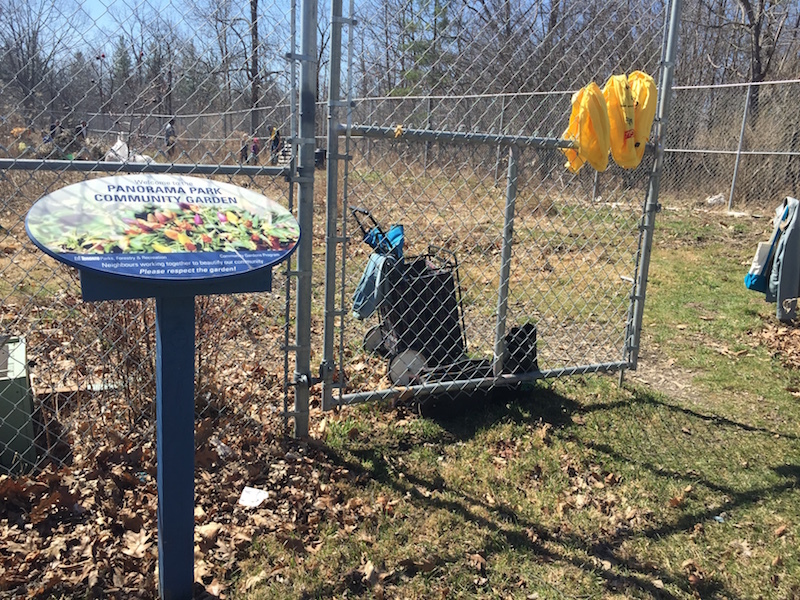 At another park clean-up I went to a stuffed Canada goose was found and a pair of antlers. At Panorama Park I stumbled across an entire car windshield smashed into the grass. After we were done, the park looked great. A good thing too because the community garden group is one of 10 groups that will have a TIFF in Your Park film shown this summer. Thanks for another great story. Re cleaning up a park, a few years ago I was cleaning up the park immediately behind the condo highrise building in which I lived. A number of residents gave me weird looks as if they were wondering why I was bothering to do so. Actually, I just couldn’t stand looking at the mess any longer so figured I might as well clean it up myself. An added bonus was that I picked up a folded-up piece of purple paper. It was a ten dollar bill! What a rewarding way to spend my time! Thanks for sharing Linda. It is very satisfying to clean up a space like that and have it look so much better after. I’ve never found any money though!